It was love at first try. The movement is amazing, super technical yet powerful, and with that beautiful combination of bouldering and crack skills. 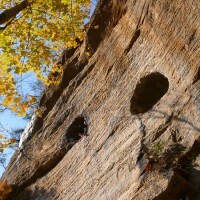 It is located up on a ledge at Long Wall and you have to climb a nice 5.8 corner to get to it. This position was a wonderful change from the busy sport crags of the Red. It made me so much more aware of how important the scenery and setting are as the climb to me. It has the smallest, trickiest gear that I have ever climbed that hard above, but it is safely protected despite 000 BD and blue aliens being an average size. This mental aspect inspired me even more.